3-Clarence William Richardson was born on 12 Mar 1874 in Paddy's Scrub, Osmaston and died on 21 Oct 1950 at age 76. Clarence married Mintie Eveline Mary Ibbott, daughter of Edward Henry Amos Ibbott and Mary Ann Margarite Goodwin. Mintie was born on 7 Jul 1881 in Richmond and died on 1 Apr 1958 at age 76. Not much is known of his childhood, but when he married Miss Mintie Ibbott he moved to a farm just beyond where the Elizabeth Town Hotel stands. While there, their first three children, lima, Reg and Ivy were born. In 1907 they moved to a farm in Cam Road where they formed a partnership with Clarence's brother, Norman Thomas Richardson. There was a lot of work needed here to clear the farm of logs and blackberries etc. before it could be put into production. They lived in a cottage on a part of the property known as "Top Farm". 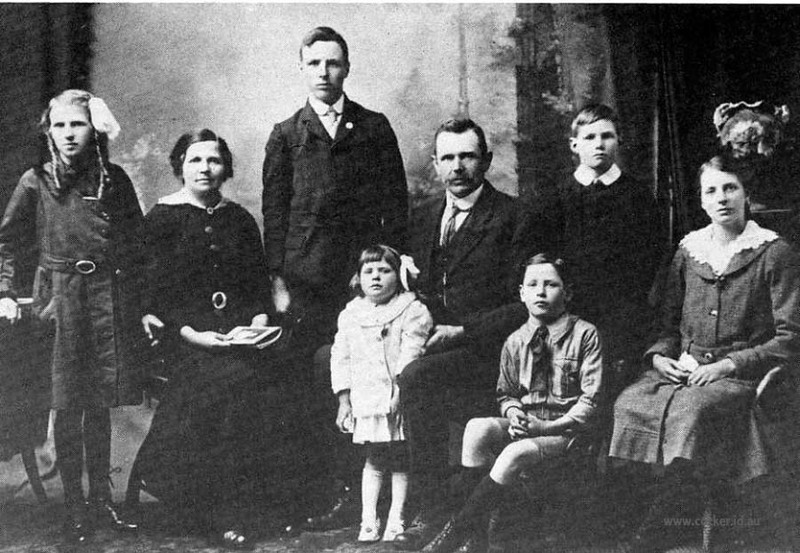 During this time their other children, Allan, Hedley, Edith and Leslie were born. They were very much involved with the Methodist Church and Clarence was Sunday School Superintendent for a number of years. In 1920 Clarence sold his farm at Somerset and moved to another farm at Sassafras where he became a well known potato grower. He developed this land into a good pastoral and vegetable growing farm. He lived on this property until his death on 21st October, 1950 at the age of 76 years. Mintie also died (aged 76 years) on April 1st, 1958. 4-Ilma May Richardson was born on 6 Jan 1902 in Whitefoord Hills, Elizabeth Town and died on 31 Jan 1987 at age 85. Ilma married Charles Woolrich. Charles died in 1959. Ilma next married Cecil Currie. 4-Reginald Clarence Richardson was born on 18 Mar 1904 and died in Dec 1942 at age 38. Reginald married Connie Mildred Cutts, daughter of Arthur Thomas Cutts and Mildred May Beveridge. Connie was born on 30 Oct 1906 in Sassafras. They had two children: Geoffrey Allan and Max Arthur. 5-Geoffrey Allan Richardson was born on 11 Nov 1932. Geoffrey married Yvonne Heather Lawson. Yvonne was born on 10 Nov 1938. They had two children: Melinda Louise and Katrina Ann. 6-Melinda Louise Richardson was born on 9 Mar 1961. 6-Katrina Ann Richardson was born on 13 Dec 1964. 5-Max Arthur Richardson was born on 13 Jul 1937. Max married Jennifer Loris Cox. Jennifer was born on 27 Dec 1940. They had five children: Anthony Charles, Timothy Dale, Kristie Ann, Clare Maree and Katy Louise. 6-Anthony Charles Richardson was born on 13 Jul 1962. 6-Timothy Dale Richardson was born on 16 Nov 1964. 6-Kristie Ann Richardson was born on 15 May 1971. 6-Clare Maree Richardson was born on 17 Jul 1972. 6-Katy Louise Richardson was born on 14 Dec 1978. 4-Ivy Esther Richardson was born on 25 Nov 1906. Ivy married Robert Norman Beveridge, son of Robert Beveridge and Spurr Alice. Robert was born on 29 Aug 1894 in Mersey, Devonport and died on 29 Apr 1976 at age 81. They had six children: Barbara May, Warren Norman, Shirley, Eric Rex, Laurence Frank and Ian Allan. 5-Barbara May Beveridge was born on 6 Sep 1932. Barbara married Rex William Lamprey. Rex was born on 1 Aug 1928 and died in 1998 at age 70. They had two children: Janette Maree and Daryl William. 6-Janette Maree Lamprey was born on 30 Oct 1957. Janette married James Albert Oliver. James was born on 1 May 1955. They had four children: Renae, Tahnee, Brearne and Monique. 7-Renae Oliver was born on 11 Jun 1976. 7-Tahnee Oliver was born on 9 Jan 1978. 7-Brearne Oliver was born on 29 Dec 1979. 7-Monique Oliver was born on 7 Jul 1981. 6-Daryl William Lamprey was born on 3 Jan 1960. Daryl married Kelly Ann Jarvis. Kelly was born on 26 Apr 1964. They had one son: Luke William. 7-Luke William Lamprey was born on 7 Sep 1986. 5-Warren Norman Beveridge was born on 14 Mar 1934. Warren married Beverley May Walmsley. Beverley was born on 18 Sep 1938. They had three children: Wayne Robert, Philip Warren and Malcolm Scott. 6-Wayne Robert Beveridge was born on 29 Aug 1961. Wayne married Kim Richardson. 6-Philip Warren Beveridge was born on 25 Aug 1963. 6-Malcolm Scott Beveridge was born on 12 Feb 1968. 5-Shirley Beveridge was born on 13 May 1935. Shirley married James Desmond Yaxley. James was born on 24 Jun 1935. They had three children: Michael James, Sharon Jane and Craig Andrew. 6-Michael James Yaxley was born on 15 Feb 1959. Michael married Angela Cockrane. Angela was born on 14 Dec 1963. They had two children: Jeffrey and Leah Maree. 7-Jeffrey Yaxley was born on 25 Apr 1980. 7-Leah Maree Yaxley was born on 21 Jun 1986. 6-Sharon Jane Yaxley was born on 31 Mar 1961. 6-Craig Andrew Yaxley was born on 28 Aug 1962. 5-Eric Rex Beveridge was born on 21 May 1936. Eric married Nancy Margaret Walmsley. Nancy was born on 31 Jan 1934. They had four children: Karen Michelle, Marcus Eric, Nigel Robert and Angela Jane. 6-Karen Michelle Beveridge was born on 9 Feb 1962. Karen married Russell Leon Leary. Russell was born on 2 Oct 1960. 6-Marcus Eric Beveridge was born on 8 Mar 1964. 6-Nigel Robert Beveridge was born on 7 Oct 1968. 6-Angela Jane Beveridge was born on 22 Dec 1972. Angela married Patrick John Rogers. Patrick was born on 23 Mar 1972. They had two children: Jett Dylan and Taiga Skye. 7-Jett Dylan Rogers-Scott was born on 24 Sep 1998 in Queensland. 7-Taiga Skye Rogers was born on 25 Oct 2000 in Queensland. 5-Laurence Frank Beveridge was born on 10 Dec 1943. Laurence married Lynette Freda Clark. Lynette was born on 27 Feb 1948. They had two children: Michelle and Tania. 6-Michelle Beveridge was born on 12 Feb 1969. 6-Tania Beveridge was born on 10 Dec 1971. 5-Ian Allan Beveridge was born on 27 Apr 1947. Ian married Atholine Margaret Clark. Atholine was born on 10 May 1951. They had two children: Segnie Jane and Olivia Kate. 6-Segnie Jane Beveridge was born on 28 Aug 1976. 6-Olivia Kate Beveridge was born on 26 Aug 1978. 4-Allan Edward Richardson was born on 21 Feb 1908 in Cam Road, Emu Bay, Tasmania and died on 3 Feb 1988 at age 79. Allan married Ruby Skirving, daughter of George Charles Skirving and Jessie Charlotte Walker. Ruby was born on 7 Aug 1908 in Sassafras. 4-Hedley Bertram Richardson was born on 5 Oct 1910 in Somerset and died on 10 Aug 1973 at age 62. Hedley married Gladys Spurr, daughter of Henry Spurr and May Shaw. Gladys was born on 29 Dec 1910 in Lower Barrington, Tasmania. They had two children: Lloyd Desmond and Rex Bernard. 5-Lloyd Desmond Richardson was born on 11 Feb 1937, died on 2 Feb 2009 in Home, Tasmania at age 71, and was buried on 6 Feb 2009 in Mersey Vale Cemetery. Lloyd married Gwenneth June Mitchell. They had two children: Michelle and Darron. 6-Michelle Richardson was born on 5 Jul 1967. 6-Darron Richardson was born on 4 Jan 1970. 5-Rex Bernard Richardson was born on 22 Jan 1942. Rex married Janet Ellen Hennell. Janet was born on 15 Jun 1945. They had three children: Stephanie, Jason and Nathan. 6-Stephanie Richardson was born on 29 Oct 1970. 6-Jason Richardson was born on 25 May 1973. 6-Nathan Richardson was born on 17 Sep 1974. 4-Edith Florence Richardson was born on 17 Jun 1914 in Cam Road, Emu Bay, Tasmania. Edith married Thomas Edward Dooley, son of James Dooley and Bertha Augustus Arps. Thomas was born on 16 Aug 1903 in Winton, Queensland. They had six children: Estelle Yvonne, Diane Edith, Lewis Edward, Marlene Annette Peggy, Paul Michael and David Alan. 5-Estelle Yvonne Dooley was born on 18 Sep 1941. Estelle married Terrence Joseph Doyle. Terrence was born on 9 Jan 1942. They had two children: Jane Margaret and Lisa Michele. 6-Jane Margaret Doyle was born on 5 Feb 1965. Jane married Bruce Berryman in 2001 in Melbourne, Victoria. They had two children: Thomas Doyle and Ava Marie. 7-Thomas Doyle Berryman was born on 22 Dec 2001. 7-Ava Marie Berryman was born on 24 Dec 2004. 6-Lisa Michele Doyle was born on 5 May 1966. 5-Diane Edith Dooley was born on 23 Jan 1945. Diane married Andrew Bell Donaldson. Andrew was born on 27 Sep 1945. They had two children: Shane Scott and Joel Stuart. 6-Shane Scott Donaldson was born on 24 Aug 1972. Shane had a relationship with Jamie Cook. They had one son: Christian. Shane married Jody in 2006. They had two children: Angus Scott and Emily Jane. 7-Angus Scott Donaldson was born on 19 Dec 1993. 7-Emily Jane Donaldson was born in Apr 2008. 6-Joel Stuart Donaldson was born on 5 Oct 1973. Joel had a relationship with Sue Lindemann. They had one son: Zachary Joel. 7-Zachary Joel Wright-Donaldson was born in 1994. Joel married Shirin Wright. They had two children: Liam Joel and Caleb. 7-Liam Joel Donaldson was born on 10 Mar. 7-Caleb Wright-Donaldson was born on 13 Oct.
5-Lewis Edward Dooley was born on 23 Jul 1948 and died on 25 Jul 1963 at age 15. 5-Marlene Annette Peggy Dooley was born on 25 Aug 1951. Marlene married Duncan Hugh MacDonald Shaw on 2 Apr 1971 in Brisbane Registry. Duncan was born on 25 Jan 1946. They had two children: Christina Skye and Anthony Duncan. 6-Christina Skye Shaw was born on 10 Jan 1972. Another name for Christina is Kirsty. Christina married Mark Andrew Cranitch on 24 Jun 1995 in Indooroopilly Golf Club, Queensland. Mark was born on 3 Jul 1969. They had two children: Hamish Duncan and Matthew Patrick. 7-Hamish Duncan Cranitch was born on 8 Jun 2000. 7-Matthew Patrick Cranitch was born on 15 Feb 2003. 6-Anthony Duncan Shaw was born on 9 Oct 1977. Anthony married Dimity Glasby on 4 Apr 2009 in Mcleod Country Golf Club, Mt. Ommaney, Brisbane. Dimity was born on 14 Aug 1980. 5-Paul Michael Dooley was born on 11 May 1954. Paul married Leanne Mary McPherson in 1987 in Wanganui Gardens, Fairfield, Brisbane. Leanne was born on 12 Sep 1960. They had three children: Caitlin Jane, Jack Thomas and Thomas Ronald. 6-Caitlin Jane Dooley was born on 24 Apr 1990. 6-Jack Thomas Dooley was born on 25 Mar 1992. 6-Thomas Ronald Dooley was born on 26 Jun 1995. 5-David Alan Dooley was born on 11 May 1954. 4-Leslie Walter Richardson was born on 19 Sep 1920. He served in the Second World War. Leslie married Pearl Chatwin. Pearl was born on 6 Oct 1924. They had two children: Ross Anthony and Phillip Leslie. 5-Ross Anthony Richardson was born on 18 Oct 1946. 5-Phillip Leslie Richardson was born on 3 Nov 1951. Phillip married Helina Turner. Helina was born on 31 Dec 1955. They had one son: Nigel. 6-Nigel Richardson was born on 26 Sep 1974.